Milli Gazete columnist Reşat Nuri Erol writes on Syria's future. Here is the full article. In my previous two articles, I gave general information about “constitution works” we did until now, and especially about “constitution of humanity according to fair order”. Let us remember once again the constitutions that we have prepared and wrote the definitions in our previous article: 1) Person constitution. 2) State constitution. 3) Township constitution. 4) Provincial constitution. 5) Country constitution. 6) Constitution of humanity. The Syrian problem cannot be ended only with the system of “war”; there are also things that should be done with the system of “peace”, and the overriding of these should be “the CONSTITUTION work”. 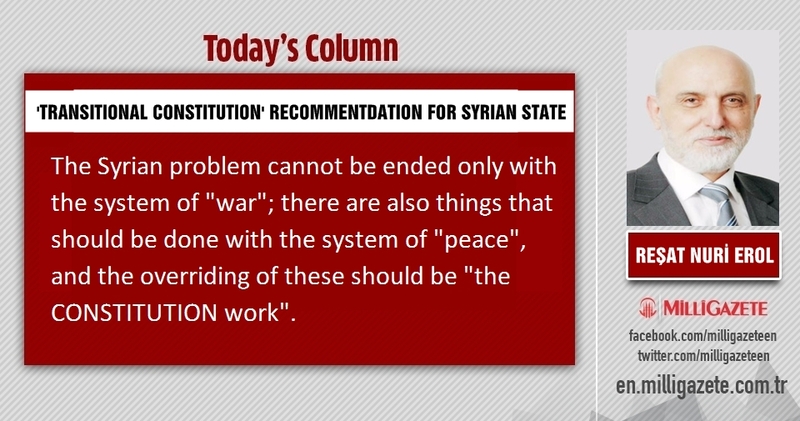 “The Syrian State Constitution Work” should be done in advance so that there won’t be happen problems again. “The Syrian Constitution” should also be an exemplary constitution to the countries of the region and the world. The first five articles of our ten-article recommendations are as follows. Article 1 - The Syrian State is an independent state established by the Syrian people composed of Syrian citizens and their children in 2000, on the territory which’s boundaries are drawn on the map indicated by codes. Its language is Arabic. Its center is Damascus, and the flag of 2000 is its flag. Article 2 - The President of the Republic shall be promoted to honorary chairman after completing its period or reaching the age of 70. Instead of him, according to the provisions of this constitution, the new president will be elected. This constitution is a temporary constitution and the permanent constitution will be prepared by implementing in time, by the Syrian Parliament that will be established according to this constitution. Article 3- The President is the Chief of Staff. He chooses a general commanders from the generals and can always change him. Syria consists of about ten armies. They choose the army commanders as president and chief of staff and assign them. They can always discharge them. The citizens of Syria can be ‘military service by payment’, or ‘guard’, which they want. The price will be paid every month. The amount of the price will be determined by the state, namely by the chief commander. He will be able to change it every year to not include the olds. Those who are military service by payment on that day will pay up to the end. Military service by payment and guarding is between 15 and 65 years of age. The one who is a military service by payment can always by guarding. If the soldier by payment renounce of being guard, he has to leave Syria. The guards themselves choose their armies and serve in that army until the end. Article 4- The period of military service is one month a year. They spend a week in the Syrian army as military training. They spend the other three weeks serving in the country, the province and the township. The soldiers by payment pay their prices. Those who cannot pay are employed in military back-up services for one month. They can't be forced to fight. The guards themselves choose also their brigade in the army, namely their commander. They serve there throughout their life and they fight there. In case of war, one month period will be extended. Those services are deducted when peace comes. Article 5- The country is divided into about 10 regions. The region center provinces are governed by the state. The army commanders are also the governor of the province, the regional governor. Army commanders don’t interfere to the internal affairs of rural provinces. They can’t enter there unless they or their soldiers receive permission from the elected governors of rural provinces. The soldiers who form the army are made up of provinces that aren’t in that region. In other words, the person can’t do military service in his own region. Details about these articles are in our next article.